Accessibility includes Closed Captioning and SAP Video Description. Closed captioning may be turned On/Off, and is specific to your device. This means if you turn Closed Captioning on, it will display for any user who signs into the same device. SAP/Video Description may be turned On/Off and is a combined feature, specific to your username. SAP (Secondary Audio Programming) allows you to hear a program's audio in different languages. In cases where the selected language is not available, SAP defaults to English. Video Description is an enhancement of Closed Captioning. With Video Description, you will see a description of key visual elements that are happening on screen. This will be played on one of the selected options if the program is enabled with Video Description. Preferences includes Parental Controls, Favorite Channels, Caller ID and Recording Preferences. 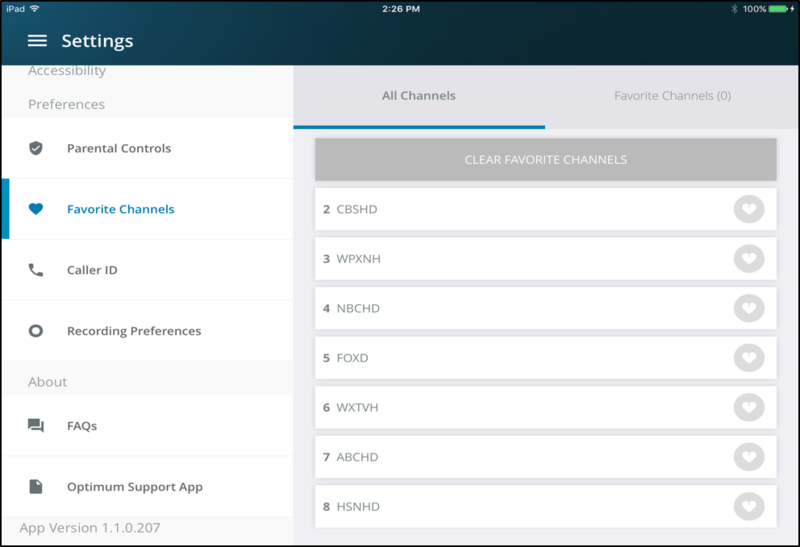 Favorite Channels is where you can set networks as your favorites. Selecting a Favorite Channel displays a blue heart on the network in the Guide and Channel Guide View. The Favorites filter can be applied from the Guide filtering the networks displays by networks selected as a 'Favorite' from Settings. Recording Preferences saves you from having to select recording options with Cloud DVR each time a program is scheduled. Click here to learn more about Cloud DVR.